223 pages | 3 B/W Illus. Political and societal elites are increasingly confronted with complex environments in which they need to take collective decisions. Decision-makers are faced with policy issues situated at different intertwined levels which need to be negotiated with different actors. The negotiation and decision-making processes raise issues of legitimacy, leadership and communication. Modern societal systems are not only affected by horizontal specialization and diversity but also by a vertical expansion of governance layers. The national level is no longer the sole, or even the most important, level of governance. In these complex environments, cognitive abilities and personalities of political and societal elites have gained importance. 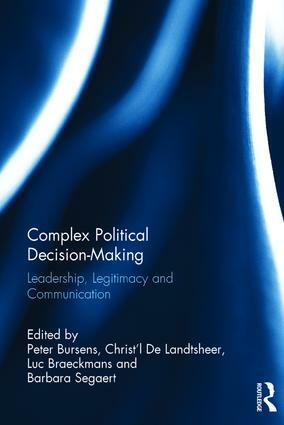 This book addresses the impact of an increasingly complex environment on the legitimacy and transparency of polities, on the role of leadership and political personality and on motivated images, rhetoric and communication. Examining how these issues interact at the macro and theoretical level, the types of problems decision-makers face and how they communicate ideas with their audiences, it brings together leading experts in political psychology, law and political science to bridge the gap in the way these disciplines explore the issue of complex decision-making. 3. Collective Decision Making within the European Union’s Legislative Competences: A Need for Change? 4. Diversity and Democratic Legitimacy in the EU: What Can We Learn from Other Federal Systems? 6. Leaders under Stress: Does Cognitive Ability Affect Career Stability? Peter Bursens is Professor of Political Science at the Department of Political Science of the University of Antwerp, Belgium. He also teaches at the Antwerp Management School and at the Université Libre de Bruxelles, Belgium, and holds a Jean Monnet Chair ad personam from the European Commission. Christ'l De Landtsheer is Professor at the Department of Communication of the University of Antwerp, Belgium. She has taught at numerous institutions across Europe, Russia, the United States and China. Her interests are in the psychology of politics and political personality, as well as political rhetoric and metaphor. Luc Braeckmans is Professor at the Department of Philosophy at the University of Antwerp, Belgium, and Chair of the Centre for Andragogy. He is also Director of Academic Affairs of the University Centre Saint-Ignatius Antwerp, Belgium. Barbara Segaert is Scientific Coordinator at the University Centre Saint-Ignatius Antwerp, Belgium.